Good friends, good food, a lazy afternoon in the sun - what could be better than a leisurely menu of quick and easy grilled appetizer recipes to keep everyone happy! Perhaps something to go with that jug of Sangria? Whatever the occasion you'll find simple appetizers for the grill that everyone will love. We've included shrimp and scallop appetizers, make ahead appetizers and easy party appetizers including barbecue chicken, vegetable or beef tenderloin. The collection is growing so check back often to see what's new. Spicy grilled Shrimp & Chorizo appetizers Try the unusal flavor blending of grilled shrimp, red onion and spicy Chorizo sausage. 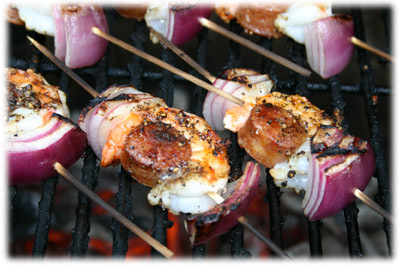 Grilled on smaller skewers these make excellent appetizers or serve well as side dishes with other seafood or chicken. Great with other sausages like Andouille or Hot Italian too. Stuffed Jalapeno Peppers wrapped in Bacon Easy to make and easier to eat - these grilled jalepeno appetizers are filled with cream cheese (flavor of your choice!) and wrapped in bacon. These are real party favorites and at my house they usually get eaten right off the BBQ. 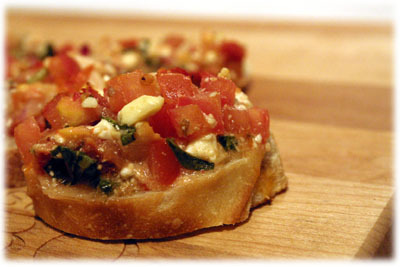 Grilled Chicken Bruschetta recipe Bruschetta has become one of the standard party appetizer recipes. You should look for something that's easy to prepare and just as easy to serve. This grilled chicken bruschetta recipe does that and more - I guarantee you'll find it easy to make and your guests will rave about the taste. 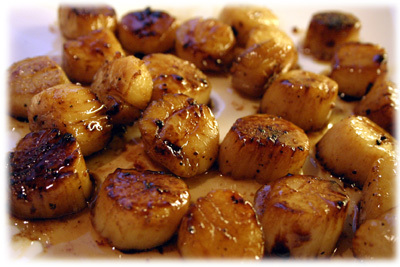 Canadian pan-seared Scallops recipe Unique recipe featuring fresh Canadian cold water sea scallops pan-seared in butter with a Drambuie reduction. Just before serving drizzle with pure Canadian Maple Syrup. "One-bite" Filet Mignon appetizers Imagine juicy, tender Filet Mignon - on a stick! 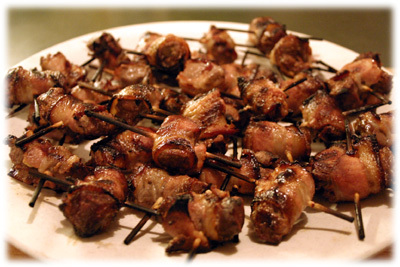 These mini skewers are truly "one-bite" cubes of marinated beef tenderloin wrapped in bacon and grilled to sizzling perfection. 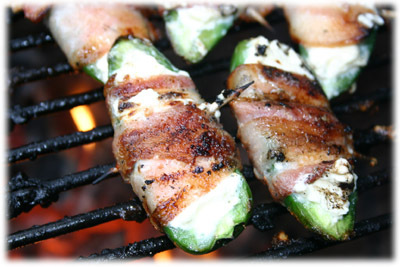 These make a great backyard appetizer and pair nicely with the Jalapeno Bombers (recipe above on this page). 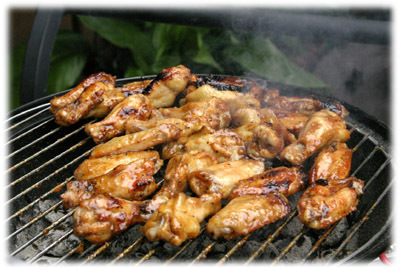 Grilled Buffalo Wings recipe Traditional Pub style Buffalo wings are great right off the grill as an appetizer. 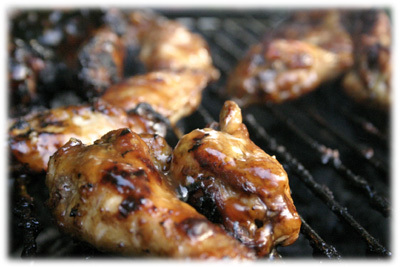 This recipe has been modified slightly for the grill and I call these wings Honey-Hot. I've added a touch of honey to the hot basting sauce which results in a sweet-heat sticky delight. Teriyaki Chicken Wings Like the wings just above, these Teriyaki Chicken wings make a great appetizer right off the grill. Next lazy afternoon you have, fire up the BBQ, pull up a chair, pour a cold one and put some of these sticky wings on the grill. Use the basting sauce as a dipping sauce when their done. Honey Garlic Chicken Wing recipe This is the 3rd in the series of grilled chicken wing recipes and is a family favorite. 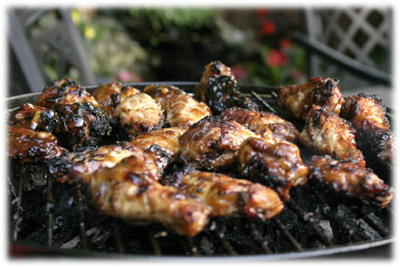 The recipe includes a traditional Honey Garlic basting and dipping sauce that makes these wings very sweet and sticky. If you love garlic appetizer recipes you'll love these wings. Grilled Pizza recipes Here's a selection of pizza's you make on your grill. 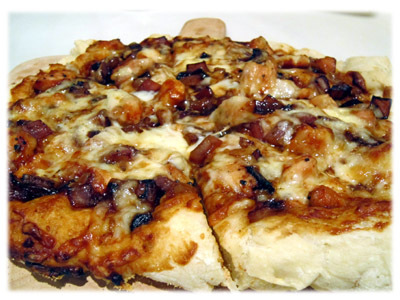 Fast, fun and easy, these BBQ pizza recipes make a great meal or an easy appetizer for a crowd. Let your guests help make one of these grilled pizza's tonight! 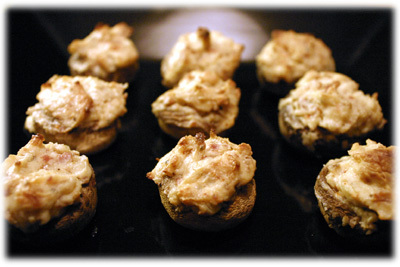 Stuffed Mushrooms recipe Grilled stuffed mushrooms are a perfect appetizer or side dish. What makes this recipe unique is it doesn't use the typical bread crumbs. Instead they're loaded with sauteed garlic, cream cheese blended with parmesean and crumbled prosciutto bacon (or regular bacon) and just enough spices to add some zip. As they melt in your mouth you'll wonder why you didn't double up this recipe. 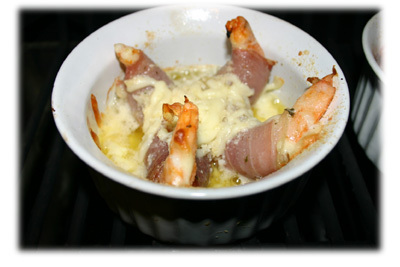 BBQ Shrimp Scampi recipe Restaurant quality, cream cheese filled jumbo shrimp wrapped in proscuitto, bathed in melted garlic butter and covered with grated cheese. 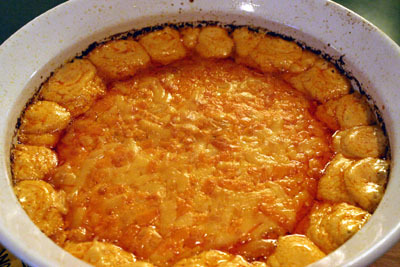 Cooked on your BBQ you can serve this as either an appetizer or delicious side dish. 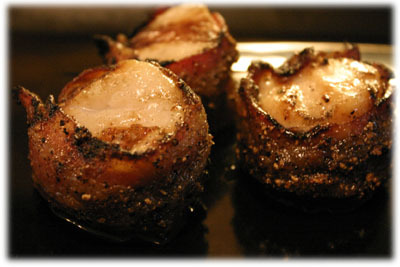 Bacon-wrapped Sea Scallops One of the most popular appetizer recipes used for entertaining guests are bacon-wrapped scallops. While you can buy them pre-made they just don't taste as good as these that you make yourself. The real secret behind these is the seasoned bacon thats wrapped around them, spiced with crushed peppercorns, garlic and brown sugar. Jumbo Bacon-wrapped Shrimp This is becoming one of the most popular grilled appetizer recipes on the site. They're so easy to make and even easier to eat. 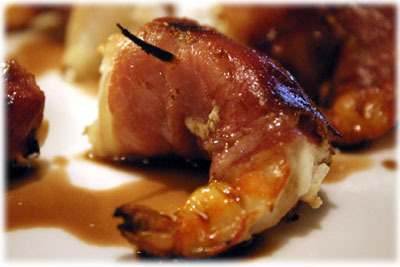 Jumbo shrimp stuffed with goat cheese and wrapped in either bacon, prosciutto or pancetta. Only 6 minutes to grill! Buffalo Chicken Dip appetizer If you and your friends like spicy Buffalo Chicken Wings then you'll love this cheesy, spicy Buffalo Chicken Dip party appetizer. Lot's of Franks Red Hot Sauce spices up the grilled chicken and the cream cheese and cheddar cheese make it a great gooey buffalo dip. Great for your next party. 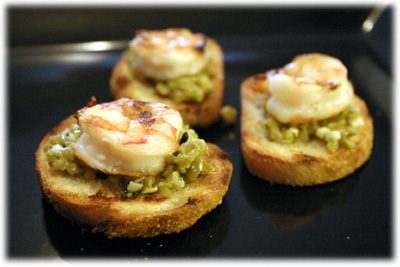 Quick & Easy Shrimp Appetizers Quick grilled shrimp and olive tapenade are an amazing flavor combination on these quick and easy appetizers. 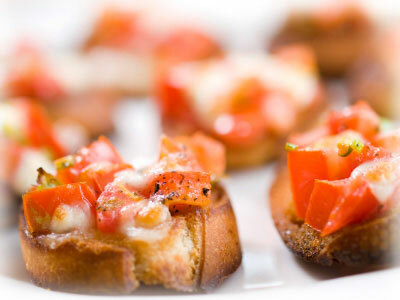 Served on toasted baguette slices or melba toast these appetizers can be partially made ahead to save time. 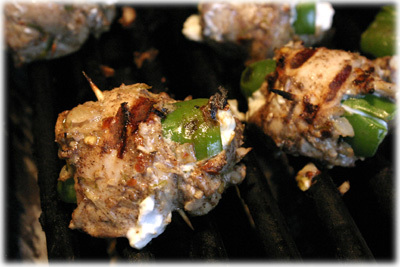 Jerk Chicken Appetizers Famous Jamaican Jerk Chicken thighs wrapped around Jalapeno's and creamy Goat Cheese. These make great grilled appetizers for those lazy afternoons in the sun.